Delightful mystery and I enjoyed every minute of it. 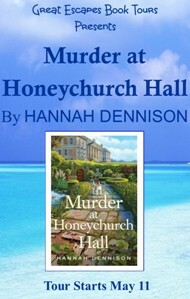 “Murder at Honeychurch Hall” is a fantastic start to a new series. It’s quirky, funny, and engaging. You can vacation in Devon this summer for merely the price of a book! I was kept thoroughly entertained throughout this book, not only by the mystery but by the many quirky characters that inhabit Honeychurch Hall and the town of Little Dipperton in the Devon countryside. Set against the backdrop of Agatha Christie’s beloved Devon, TV celebrity Kat Stanford discovers that her newly widowed mother Iris has recklessly bought a dilapidated carriage house on a country estate known as Honeychurch Hall. Although times have changed at the manor house, a line still exists between those upstairs, and those down. Iris’s arrival is greeted with suspicion—but that’s not all. Iris harbors an even bigger secret that not even her daughter knows: Iris writes under the pseudonym, Krystalle Storm, and is a best-selling author of racy bodice-rippers. Throw in a feisty, octogenarian countess, a precocious seven year old who is obsessed with the famous fighter pilot called Biggles, a treasure trove of antiques; as well as the paparazzi, always hungry for celebrity news. Add the occasional haunting from the resident family of ghosts, and there is more than one motive for murder. Yet at its core, the story explores the relationship between a mother and daughter facing new and uncertain beginnings and makes a good case for the notion that those nearest and dearest to us are often the most duplicitous of all. 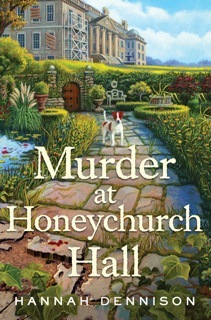 Murder at Honeychurch Hall (Minotaur Books; May 13th; ISBN 978-1-250-00779-7; $24.99) is a delightful read filled with good old-fashioned storytelling and set in Agatha Christie’s beloved Devon. Hannah Dennison hilariously captures the subtleties of life within the walls of a grand yet crumbling English country estate, and along the way she makes a good case for the notion that those nearest and dearest to us are often the most duplicitous of all. As our story opens, TV celebrity Kat Stanford discovers, to her chagrin, that her newly widowed mother Iris has recklessly bought a dilapidated carriage house on the country estate known as Honeychurch Hall. Although times have changed at the manor house, a line still exists between those upstairs, and those down. Iris’s arrival is greeted with suspicion—but that’s not all. Iris harbors an even bigger secret that not even her daughter knows: Iris writes under the pseudonym, Krystalle Storm, and is a best-selling author of racy bodice-rippers. Throw in a feisty, octogenarian countess, a precocious seven year old who is obsessed with the famous fighter pilot called Biggles, a treasure trove of antiques; as well as the paparazzi, always hungry for celebrity news. Add the occasional haunting from the resident family of ghosts, and there is more than one motive for murder. “I hope you’re not driving, Kat,” chided my mother on the other end of the line. I turned into Bolton Place, a quiet residential street divided by two graceful crescents that encircled communal gardens. Spotting a space outside the church of St. Mary’s, I parked and switched off the engine. “You know very well my boyfriend is called David,” I said, annoyed that she always knew how to hit a nerve. “God, it’s boiling.” I wound down the window, taking in the heat of a hot August day and the smell of freshly mown grass. Another even longer pause and then, “I’ve broken my right hand,” she said bluntly. “I’ll drive over straight away,” I said. “I’m not an invalid, you know,” said Mum. This was rich coming from someone who spent all my school holidays with a migraine lying down in a dark room. “And Alfred is whom? Your Spanish boyfriend?” Nothing would surprise me at this point. “Because that’s what you told me,” I shouted. “Thanks for reminding me, Mum,” I said. “No,” said Mum coldly. “I don’t want you here. I already have someone who is longing to lend me his hand. He’s very kind. Very kind indeed.” And before I could utter another word, my mother hung up. I was deeply perplexed. It was clear that Mum’s grief had made her rash and impulsive. What had possessed her to move so far away from London? The fact that she’d managed to get into my father’s carefully protected pension fund was extremely worrying. My mother was notoriously hopeless with money. It was a family joke. Dad and I had gone to great lengths to make sure that she’d just receive a monthly allowance so she couldn’t spend it all at once. I felt I’d let him down and he’d only been gone four months. There was nothing else for it. I’d have to drive to Little Dipperton, wherever that might be, and make her see sense.